Starting this month, Arrow will have TV audiences pinned to their sets, as DC rolls out the stars of it's street level character library, and perhaps even create new ones, in the same fashion Batman The Animated Series birthed Harley Quinn. One of the show's most noteable converts is the not-so-modest marksman Deadshot, who thanks to the Huffington Post, can now be spied below eye-to-eye. 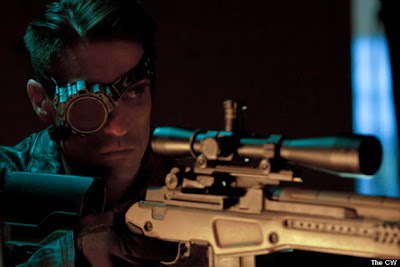 While that eye-patch may make it seem if he fell of a bridge he'd sink straight to the bottom, Deadshot appears in the series' third episode, titled Lone Gunman. Played by actor Micheal Rowe, and with Amanda Waller appearing in the Green Lantern movie, could DC be using both it's film and television universes to build it's Suicide Squad? I heard the Bronze Tiger is appearing also. Personally Im looking forward to seeing the Huntress. Bronze Tiger would be a natural fit and lead to much needed exposure for that character Karl - BT should be treated like DCs Iron Fist only more Luke Cage than Danny Rand in nature. Aliera Im excited for this too, and it looks as if Oz will air it at the samevtime az the US so its a double win! Dan, do you know how syked I am waiting to see Deadshot and Deathstroke? If the Bronze Tiger show up correctlly....DUDE!!! My whole blog spot is going to go Green!